1. First, frost your cake with a crumb coat (a thin layer of frosting not meant to look pretty, just to keep all the crumbs from messing up the final product.) Let it chill at least 20-30 minutes before moving on. 2. Then, add the frosting of your choice to a pastry bag fitted with a plain round tip. You can use any size you like depending on the look you are going for – bigger dots, smaller dots, whatever you prefer. I went with Ateco #809 here. 3. Pipe a line of equal sized dots vertically down the side of the cake. Use the back of a spoon to spread each dot sideways. 4. Repeat with another line of dots overlapping the previous smeared edge. Smear, dot, repeat, until you’ve covered the sides of the cake completely. Easy! You can make your cake look very neat and uniform or more fluffy and whimsical depending on what you are going for. 5. There are many ways you could choose to cover the top. I used the same technique to create a sort of spiral from the center outward. You could also do the same thing in the reverse direction (from the outside inward), or do more of a wheel spoke pattern. Whatever you like – your call. Champagne extract can add an unexpected and pleasing taste to yellow cakes. The champagne flavoring will give the cake a slightly more adult taste, while still keeping all the fun of having a piece of cake! For people who really enjoy the champagne taste of the extract, a few drops mixed into the white icing will reinforce the taste without allowing the combination to be too overpowering. As a flavoring created to enhance the taste of all sorts of baked goods and sweet treats, champagne extract can be used in most of the same ways that people use vanilla and other types of extracts. The units of measure will be the same, so if a recipe calls for one tablespoon of vanilla extract, simply use one tablespoon of champagne extract instead. 1. Preheat oven to 350 degrees. Butter the pan(s) you are using. For my cake, I multiplied this recipe by six, and used one 14 inch cake pan, one 12 inch cake pan, and one 10 inch cake pan. 2. In a large bowl, cream the butter and sugar until very light and fluffy. Sift flour, baking powder, and salt together, and then blend into creamed mixture alternately with champagne. 3. Next, beat egg whites until stiff peaks form. Fold 1/3 of the whites into batter to lighten it, then fold in the remaining egg whites. Pour into prepared pan(s). Bake at 350 degrees for 25 to 30 minutes, or until a toothpick inserted into the cake comes out clean. In the bowl of an electric stand mixer with a whisk attachment, whip the butter until creamed. Add the powdered sugar and champagne and mix until the ingredients are evenly incorporated and the frosting is smooth and creamy. 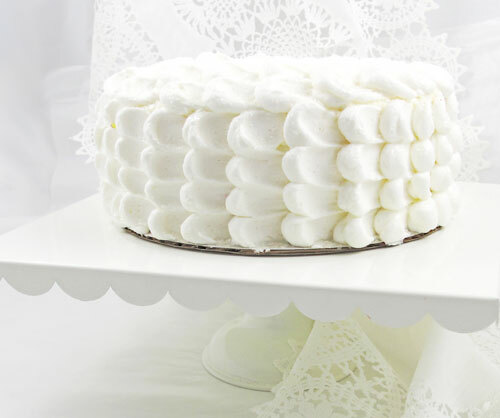 This entry was posted in Birthday Baking, Instructions & How-To's, Recipes & Tips, Spring Baking, Summer Fun Baking, Wedding Baking and tagged champagne cake, champagne extract, champagne frosting, cloud cake by Fancy Flours. Bookmark the permalink. Definitely a must for New Years. They look so yummy, Definetly preparing in this weekend.